Luxury carbon fiber furnishings for indoor and outdoor spaces. Elegant and transitional carbon fiber furnishings for indoor and outdoor spaces. This folding chair is the pinnacle of luxury and function. The chair is engineered to be free standing as well as lightweight, making it the most elegant folding chair on the market. 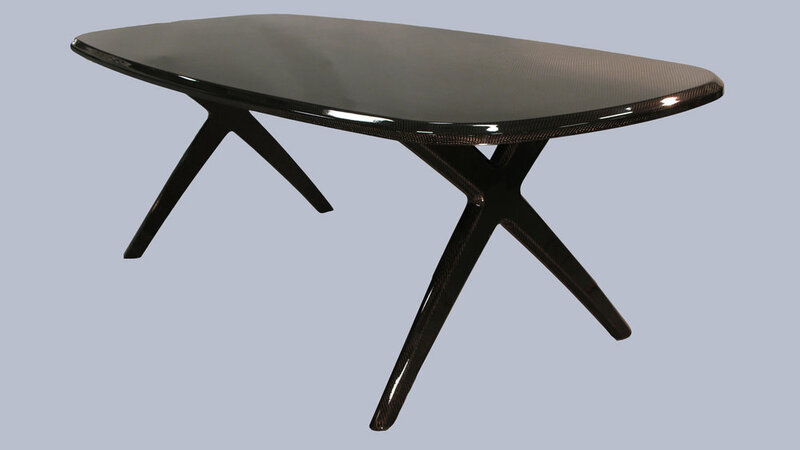 This folding table is strong yet luxurious with a glossy finish that you would find on a high-end sports car. It is the perfect transitional furniture to seat eight for dinner or play cards on the deck of your yacht. The pristine detail of the compass on the Compass Bench is a testament to engineering and design. This bench is the perfect size for two and is a part of the complete luxury furniture set. © Clear Carbon Interiors, Inc. 2018 All Rights Reserved.